We’ve seen lots of surprises at our new home this spring. 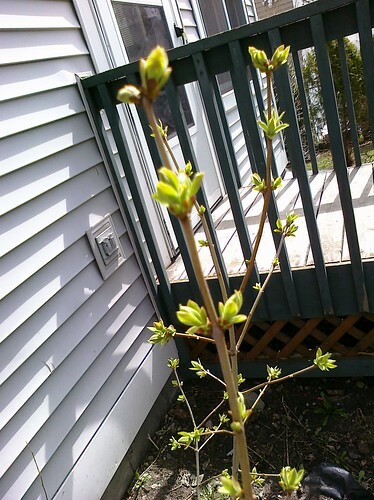 One such is this budding bush I snapped a picture of on March 31. That now looks like this on May 4. I found this great article on front porches and community. It is excellent. I’ve been passing it along to lots of people. 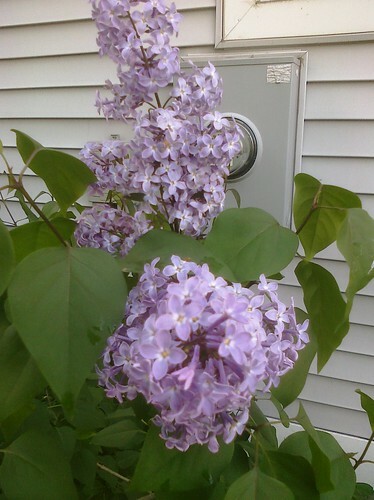 It is especially fresh in my mind as spring is starting to finally show up. This past weekend I actually sat on the front porch (in a folding chair) and read for a bit. Yes, 46 is a little chilly to be just sitting in the shade of the porch, but it felt nice. I noticed some kids I hadn’t seen before and observed neighbors and guests wandering around. This intermediary social nature of the porch is its strongest asset. The porch is a physical space that is both personal to its owner and hospitable to guests and strangers. It is a threshold of community: neither a place of anonymity, nor of complete intimacy. It is a place where new connections are wrought and old connections are strengthened. One can be invited onto a front porch even as a passerby; it provides opportunities for welcoming the stranger. What are your thoughts on the front porch? Why has most of our culture move to the back porch? I guess the staircase has been done for awhile. We recently got the carpet finished thanks to Home Depot we got a nice frieze carpet – bamboo colored with dark speck. After the pictures I’ll list what we still want to do. The only thing left is to decorate! You may recall that we bought a house. We’ve been here almost 2 months!! It is slowly coming together. If we waited until everything was 100% then we’d never get any pictures up! So here is a quick look at our kitchen. After the pictures I’ll list what we still want to do. We still need to get a stainless steel range hood, we haven’t decided on what to do with the flooring, and we actually need to decorate! Adventures and Thoughts of Team Cross is powered by	WordPress 4.3.19 and delivered to you in 0.322 seconds using 36 queries.